Papua New Guinea, certainly one of the last great areas of land on Earth to remain partially unexplored; this remarkable remote landscape still remains a place of great wonder and deep mystery. Exotic birds, plant life and rare animals, unique extraordinary art and languages and colorful warriors await the curious and intrepid traveler. Lost worlds, whether they be imaginary prehistoric islands in the thick mist that time simply forgot or more plausible. The last few remaining unexplored parts of the planet have always held mystique with adventure travelers. Many explorers will attest that the most remote, inaccessible and most culturally intoxicating places to visit on the planet are those idyllic locations that the grip of the modern world has yet to fully grasp. 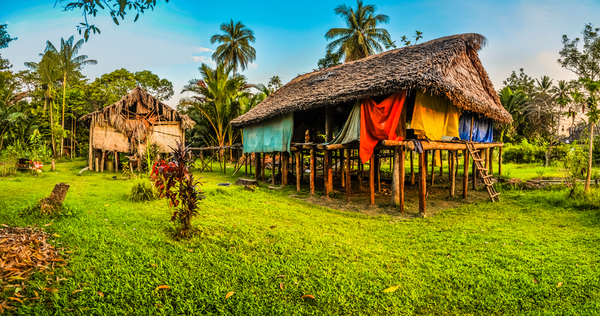 Photo of simple houses made of straw and wood in Avatip, Sepik river in Papua New Guinea. In this region, one can only meet people from isolated local tribes. Global travelers and adventurers have long been painfully aware that the world’s supply of exciting unexplored regions and lost cities are in serious decline; this is a fact that is not lost on modern adventure travelers searching for trip ideas with travel companions that are truly unique. Twenty-first-century technology, of course, has done a great job of mapping every inch of the Earth’s surface from space, probably to the detriment of many modern day explorers since ‘lost worlds’ just don’t seem so lost anymore. Papua New Guinea is one of the few places on Earth where the jungle and rainforest are so thick as to obscure much of the overhead satellite imagery and mapping, thus the only way to properly explore the jungle floor and reach the most secluded villages is by placing feet firmly on the ground. Why Visit Papua New Guinea? The country is one of the world’s least explored, culturally and geographically, part of Oceania and once a territory of Australia before 1975. Papua New Guinea is now its own land, although it remains part of the Commonwealth and is one of the last bastions of exploratory adventure for curious explorers. New Guinea is particularly famous for the many undiscovered species of plants, insects, birds and animals that are thought to exist in the jungle interior of Papua New Guinea. Nature and animal lovers should note how scientific expeditions to the remote jungles are frequently revealing remarkable new species of wildlife each and every year; proof that for now our world still has some well-kept secrets that remain undiscovered. Although we don’t believe that there are any prehistoric dinosaurs left, sorry! As a global traveler, if lost temples, isolated jungles, exotic species and appreciate the rich culture of the Papua New Guinea people stirs the emotions and wanderlust then this could be just the place to journey to. 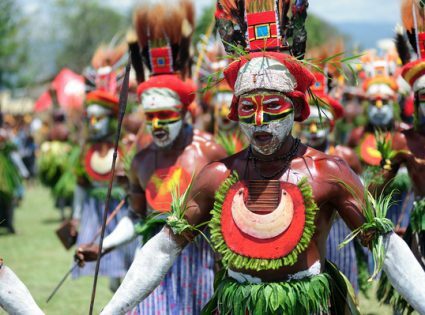 Papua New Guinea is one of the most culturally diverse countries on the face of the Earth, at the last census study the region boasts over 850 indigenous languages and individual societies, out of a recorded population of just under seven million people. New Guinea is a vast rural area, there are lots of picturesque villages, farms and isolated settlements, since only 18% of its people live in urban city centers such as Port Moresby. There is no right way to properly experience this remarkable land, just your way. However, a trip to New Guinea could begin the Tari Valley, home of the colorful Huli, a unique and distinctive race of people whose right of passage when a young boy enters adulthood is not fighting Lions or Tigers. Instead, the young men are encouraged to grow their own human hair wigs of all things In the forest surrounding the valley awaits a plethora of thirteen species of birds of paradise and a whole host of unique orchid species, many are rare or as yet undiscovered in the ecosystem. From there, the wondrous journey continues to the Sepik Region and Karawari Lodge – now an area of accommodation that was still a restricted place for visitors as recently as in the 1960’s. Papuan woman and a little boy of Korowai tribe in the jungle of New Guinea Island. Discover the busy river life on the Karawari River and view spectacular primitive art as well as an incredible array of parrots and orchids and revel in their unique sounds. From the Sepik Region and back to the highlands to explore the world of the Melpa people. Exploration continues in this area where no white foot had ever trodden until the mid-1930’s. In short, there is plenty to do and see for every possible type of traveler to this remote tranquil region of the world. Be sure to bring your camera and video recorder, for they will see heavy use. There is no right way to explore the jungles and villages of Papua New Guinea but the travel ideas below should give most explorers seeking a decent balance between adventure and luxury the best of both worlds. Port Moresby is the capital and largest city and by far the most urbanized, from here stay in a city hotel for one night. The next day travel to Tari, also known as ‘The Tari Valley’ – home of the Huli. The Huli were not known to Europeans until 1936, they are a vibrant and proud people that choose to live in much the same ways as their ancestors from centuries past. In the Tari Valley stay at Ambua Lodge, this accommodation is high on the slopes of the Tari Valley and offers travelers breathtaking scenery and views of the slopes and surrounding mountain peaks. The afternoon in the Tari Valley is best utilized by exploring the surrounding area near Ambua. Enjoy trekking through dense mountain forests, hillsides and jungles while cooling off near rushing waterfalls, all these wild sights and more entice the visitor to Ambua. We are still in Tari enjoying the ecological wonders and the wildlife and rare species. The area is full of extraordinary birds of paradise and strange and unusual orchids and wildflowers and plants. Meet the remote and reclusive Huli people and learn about how they live; working the land and living a simple but culturally magnificent life that has not changed significantly in generations. Overnight stay again in Ambua Lodge. Finally, leave Tari by air to Karawari airstrip. Along the way, you will cross some of the remotest but most visually stunning landscapes and vistas in the world today. The landscapes are simply intoxicating and awe-inspiring when viewed from the air. This overland area between the regions known as Ambua and the Sepik is a spectacular array of sharp rugged limestone rocks. These rocks seem to rise and fall like jagged teeth. You will be glad that you are gazing down from above. Soon after touching down at the Karawari airstrip, the journey across New Guinea sees travelers boarding a riverboat. A long journey awaits as we travel across snake-infested waters to Karawari Lodge. Karawari Lodge is situated above a steep ridge. It boasts a spectacular view spanning hundreds of miles of thick dense tropical rainforest and jungle. The lodge is built in the guise of local architecture. It is constructed with traditional building materials like wood, straw, and rope. While it still provides modern luxury to Western standards. Travelers will stay overnight at Karawari Lodge. Rise early in the morning to the sound birds, specifically the sound of Lorikeets and Eclectus Parrots. 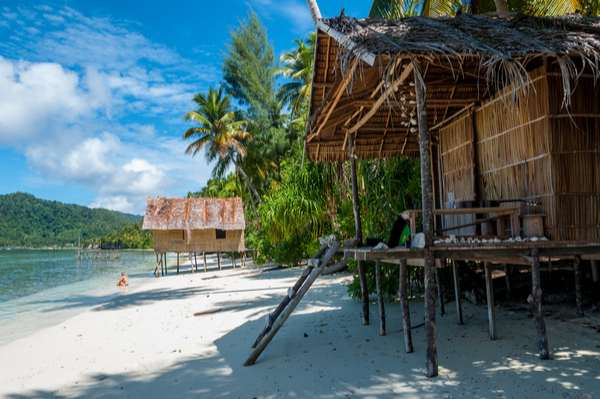 After a hearty well-needed breakfast, embark on a variety of ecological and cultural touring trips to learn about the Karawari area. Overnight stay once again at Karawari Lodge. It is back to the airstrip to board a new charter flight to Mount Hagen; during the flight huge mountains rise up to astonishing heights from the barren flats of the Sepik Basin. Arriving at the airport head for Mount Hagen Town. Which is located in the upper Wahgi Valley. The valley is home to some of the oldest examples of agriculture in the known world. High up the slopes of Mount Kuta is Rondon Ridge. A guest outpost and accommodation for travelers that delivers magnificent and truly unbelievable views of the Wahgi Valley. Stay the night at Rondon Ridge. Good use of time after breakfast is a good day trekking through the Mount Hagen Area. Also, the lower Wahgi Valley. Here, live local people known as the Melpa. They are villagers with an ancient and rich culture, despite the slowly encroaching modern world. The Melpa people still live modestly. They have a carefree and humble life with little need or desire for the trappings of technology or lifestyle. A colorful and stunning array of birds, orchids, small animals and rare vegetation populate the mountains. Also, the lowlands surrounding the Wahgi Valley. These are remarkable sights that the keen naturist animal lover will fully appreciate. Overnight stay once more at Rondon Ridge. The adventure trip of a lifetime to the rugged wilderness of Papua New Guinea is almost at an end. This morning travelers will depart for Port Moresby. At Port Moresby, they will take an going international flight to the United States, Europe, and beyond. 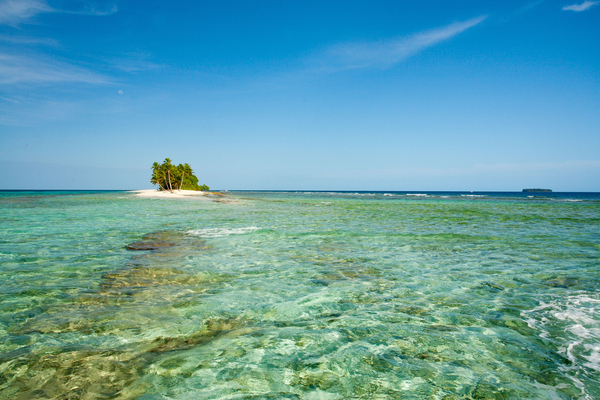 The New Guinea adventure is now a memory. But our travelers return to the place they call home, refreshed, fulfilled and with a certain knowledge that they have seen firsthand and experienced the magnificent vistas and scenery. 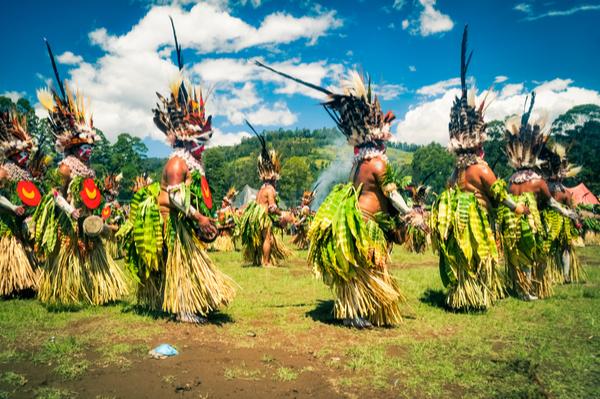 Also, the people and rich culture of one of the Earth’s last remaining full explored frontiers, Papua New Guinea.